Easter is a great time to get together, even if you don’t celebrate the religious aspect. It’s a Sunday when businesses close and families (for better or worse) gather ’round the table. If you’re totally anti-holidays and religion, just pretend you live in Europe where everything (!) is closed on Sunday. Invite loved ones over for a potluck and open a bottle of wine. Why are potlucks so awesome? A helpful tidbit about potlucks: bring something YOU WANT TO EAT. Vegetarian, vegan, pescatarian, Presbyterian, bring a dish you love. When attending a community eating event, most people tend to bring food they would never eat at their own house… buffalo ranch chicken dip, triple buttered cookies, bacon wrapped kielbasa, etc. Thus it’s up to you to keep it real – what do you normally eat? 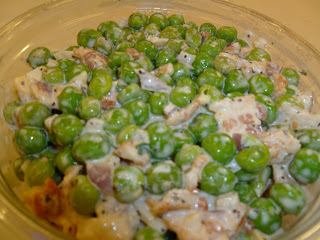 How about pea salad with bacon? It’s fresh, a little creamy and studded with salty bits of bacon. Seems like a good mix to me. Adapted from Dana Burns, a lovely lady I worked with at the deli. Her instinct and creativity with food is of constant intrigue.